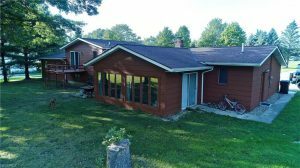 13451 Chardon Windsor Rd, Chardon Welcome to this sprawling Split Level home on over one and half acres. All the bedrooms are very spacious with plenty of closet space. The beautiful fireplace in the family room is a added feature for those cold winter nights An addition was added to this home for more privacy and almost 3000 sq ft. Extensive upgrades have been recently been done.